An aquarium they say is a great source of relaxation and peace. In fact, it has been recommended for people with stress problems and high blood pressure. But if you are thinking of getting one, you need to think of whether you have the time as well as the money to invest in it. How do you go about starting a saltwater aquarium? It’s not just about making up our mind, buying a tank and filling it up. It involves a lot more than that. Especially as it’s going to be the abode of your very expensive fish. So it warrants a bit of planning and organizing before you can actually own one. We give you a few easy tips on how to choose right and get the best deal for your money. First of all, decide on what kind of fish you want. Why is this so important? Each type of fish has different needs. They will require different amounts of space in the tank. So it’s necessary to help you plan the size of the tank, space it will occupy in your home, etc. Larger fish need a lot of room so your aquarium could end up being really huge. Smaller ones can fit into much smaller spaces so then it does not make sense of investing in a large aquarium. So you will have to look for a tank based on what types of fish you plan on having. Choose a tank that is strong because water exerts a great deal of pressure so tanks have to be built well to hold up to this. Else you could have a lot of problems later and there is nothing as messy as a leaky or a cracked tank. Not just the tank, you will have to see that the surface on which it is placed is also strong and sturdy and can withstand the weight of the tank when it is full. Look at the prices. You have such a wide variety to choose from when it comes to saltwater aquariums. Maybe you liked the one at the corner pet store. However, don’t be impulsive and just go buy it. Check out the prices and options in other stores as well. Who knows – you might get lucky and pick up a really good one at a garage sale or a second-hand store. Of course, there’s always the Internet where you might have a wide choice available at very reasonable prices. Then, of course, you could go to town and get yourself a kit for your saltwater aquarium. Sure, they cost quite a bit but if you were to buy the items one by one, you’ll soon have an impressive array of stuff you can show off to your family and friends. Protein skimmers all follow one general concept, in that they remove proteins from the water. But there are different methods implemented to do so. The basic concept is that tiny bubbles of air are introduced into the water, which brings the organic materials to the surface to be pushed into a collection cup (foamy!). We are going to take a look at the different methods used to do this. Nearly all common types of protein skimmers can pretty much be categorized within these two categories Co-Current & Counter-Current. Co-current designs introduce the air flow at the bottom of the skimmer unit, flowing upwards with the water current. Basically, the air is flowing the same direction as the water. Counter-current designs introduce the air flow against the water flow, pushing the air against the water current. This allows the air bubbles to flow against the water for a short period of time before following with the flow of the water, which in theory gives the air bubbles more contact time within the water. Some argue that this makes counter-current systems more effective. Now that we’ve covered the two basic categories, let’s take a look at the different types of technologies within these categories. This is a popular protein skimmer technology that utilizes a venturi pump to introduce air to the water. The water flows through the venturi pump, air is introduced, and the water/air mix flows into the main skimmer chamber. From there, the foam overflows into the collection cup. This type of protein skimmer is the most basic, and even though it can work, it may not be as effective as newer protein skimming technologies. The idea is that an air stone is used to create micro bubbles, and the water flow it pushed through these micro bubbles. It’s a very basic concept. This technology uses pin-wheels or mesh-wheels (like an impeller) to mix air and water – the air/water is mixed directly by the impeller. The mixture is typically forced downward into the skimmer body and then the bubbles (and foam) rise to the top and flow into the collection cup. These types of skimmers are pretty popular, and can come in pretty compact sizes for smaller aquariums. Many different brands make this type of protein skimmer. These types of skimmers drive a current of water down into tubes or chambers that contain bio balls or other plastic media. This mixes the air and water effectively, and foam is pushed into a collection cup. Beckett skimmers work much like downdraft skimmers, but they don’t use plastic media to mix the air and water. A foam nozzle is used to make the air bubbles, and the stream is forced down into the skimmer chamber. This technology is patented by AquaC, and is only available in their skimmers. This works similarly to the downdraft/Beckett skimmers. A spray nozzle is fixed above the water levels and the water/air mix is pushed down through the skimmer body and foam rises into a collection cup. Is your head spinning yet? If so, just think of it like this – all of these technologies are designed to mix air and water, creating foam, which rises and flows into a collection cup. The specific way in which these types of skimmers do that may vary, but that’s what it really comes down to. If you have a saltwater aquarium, and are not using a protein skimmer, you really should reconsider. Protein skimmers can play a large role in maintaining excellent aquarium water quality – if implemented properly. To understand why you need a protein skimmer, it is best to take a look at what a protein skimmer will do. A protein skimmer removes organic and other waste from the aquarium water, it “skims the proteins”. Why Do You Need a Protein Skimmer? It can be argued that a protein skimmer may not be needed, but it really depends on personal preference and what type of aquarium is being discussed. You may not need to use a protein skimmer if you are removing wastes and nitrates from the water through other means. However, a protein skimmer gives you the ability to remove a lot of the waste quickly and efficiently. And even more importantly, this is done continuously, as a skimmer is running all the time. The organic materials that are removed from the water by the protein skimmer would otherwise be broken down into ammonia, which is not a good thing at all. This is why a protein skimmer can be so powerful. It will remove stuff that normally turns into problematic chemicals. It’s preventative maintenance. A protein skimmer sits at the bottom of a very important chain that keeps a saltwater aquarium healthy. If you don’t remove the organic wastes to some extent, you are promoting ammonia, nitrates and then poor water quality with excessive algae growth and other issues. The best protein skimmer, used in conjunction with other filtration mechanisms, can be an important cog in the wheel when promoting good water quality in your aquarium. If you are not using a protein skimmer, and are experiencing any issues we have mentioned, it is time to try to use one. It should be noted that protein skimmers are not effective in freshwater aquariums. Only saltwater promotes the methods that are used to skim proteins from the water in these devices. To better understand the need for protein skimmers, let’s take a look at the types of aquarium owners/operators that use them. People with fish only aquariums can always benefit from the use of a protein skimmer. Fish generate a lot of waste that ends up in the aquarium water, contributing to bad water quality. Live rock is also very organic and has a tendency to promote extra wastes in the water at times. For this reason, it makes sense to use a protein skimmer if you have fish only with live rock. 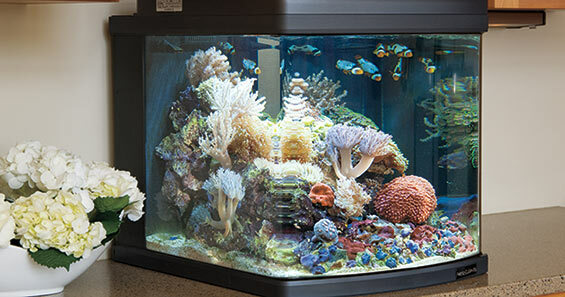 People who have corals can benefit from the use of a protein skimmer. In addition to removing organic wastes and helping to keep the water at a top quality level, a skimmer can help to remove toxins that are released by some types of corals. In a reef only aquarium, the owner will need to pay attention to a couple things. Trace elements can be removed by a skimmer, so it’s good to add these elements to the water regularly. Also, a skimmer can remove plankton from the water. When adding plankton to your aquarium, it might be best to turn the skimmer off for a few hours. Don’t let these potential negatives deter you if you fall into this reef-only group, however. Just use the skimmer smartly, and you will be able to reap the benefits that it has to offer. Many invertebrates are known to release toxins into the water, and a protein skimmer can be useful to counter this and help remove these substances. Also, some invertebrates can be intolerant of bad water quality, more so than fish. For this reason, the fact that a protein skimmer will promote good water quality should not be overlooked. As you can see, a protein skimmer can benefit pretty much all saltwater aquarium scenarios. Anybody that needs to remove wastes and organics from their saltwater aquarium can benefit from a protein skimmer.